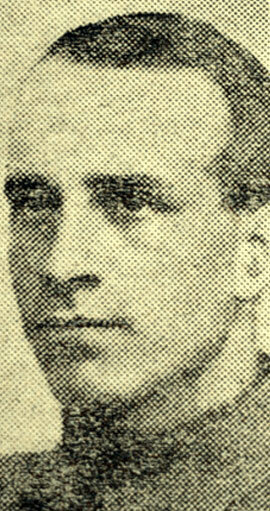 Morley Twisse was born in Bolton on 28 June 1885. He was the son of Thomas and Alice Ann Twisse of 776 Bury Road, Breightmet, Bolton. His father, Thomas Twisse, was proprietor of a cotton bleaching and dyeing business. He died in 1902. He appears on the 1911 Census, aged 25, as secretary of a cotton spinning company - presumably C H Nuttall and Co Ltd of Stalybridge. He was also a member of the Manchester Royal Exchange. Morley is described as 5’ 5½” in height, of fresh complexion with grey eyes and brown hair. He enlisted as Sapper 236082 in the Royal Engineers on 25 January 1915 in Manchester. He may have belonged to what became the 249th Field Company, part of the 63rd Royal Naval Division. He is likely to have landed at Gallipoli from Egypt on 25th April 1915. At the end of that unsuccessful campaign the Division moved to France, arriving at Marseilles 12-23 May 1916, after which it remained on the Western Front for the rest of the war and took part in the Battle of the Ancre, a phase of the Battles of the Somme 1916 (13-18 November 1916). In 1917 it was involved in the Passchendaele fighting. Morley was a first cousin of Arnold Ramsden who died from the effects of poison gas in France in May 1915 while serving as a private with the Dorsetshire Regiment. His name appears on the Roll of Honour at St James's Church, Breightmet, Bolton. 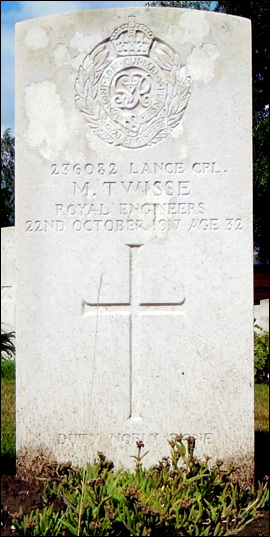 16th November 1917 TWISSE – Killed in action on Oct 22nd, Lance-Corpl Morley Twisse, Royal Engineers, second son of Mrs and the late Thomas Twisse, of Breightmet, aged 32 years. Lance-Corpl. MORLEY TWISSE, 776 Bury-rd., Breightmet, was killed on October 22nd. He served with the Royal Naval Division through the Gallipoli campaign and in Salonika, and went to France in May 1916. Later he was transferred to the Royal Engineers. Aged 32, he was an old boy of the Bolton Church Institute, and was in business with Messrs. C. H. Nuttall and Co., Ltd., cotton spinners, of Stalybridge, being a member of the Manchester Royal Exchange. News has been received of the death in action on October 22 of Lance Corporal Morley Twisse, Royal Engineers. Enlisting in the Royal Naval Division in January, 1915, he served through the Gallipoli campaign and also at Salonika. Drafted to France in May, 1916, he was later transferred to the Royal Engineers. He was 32 years of age. and was the second son of Mrs. and the late Mr. Thomas Twisse, of Breightmet, Bolton. He was in business with Messrs. C. H. Nuttall and Co., Limited, cotton spinners, Stalybridge, and was a member of the Manchester Royal Exchange.